There have been a lot of lovely stationers and gizmos attract children in Japan. We were the frustrated children who couldn't have enough of them. We have grown up, and still be hooked. Thus we bought two knitting gizmos and tried them. This is a report on it. 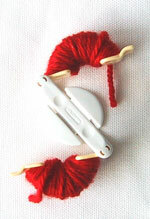 'Super-Pompom-Maker' is a tool to make pompoms. At a glance, you might wonder if you need such a tool to make pompoms. It's true that you can make pompoms with even a piece of paper. However, this is not an ordinary pompom-maker. It's a SUPER pompom-maker. You cannot help but try it, can you? 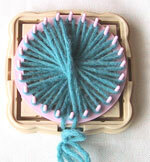 A Super-pompom-maker is somewhat similar to a yo-yo. But it can be separated in half. Each half have two half-doughnut-like-shaped arms. An axle tree is made of stainless steel. Join the two parts again, open two arms together. Wrap the yarn around the arms. Wrap the yarn around the other side of arms. Not only twisted yarn, but straight fiber is available. Close the arms. Cut the yarn around the 'Super-Pompom-Maker'. With the thin string, wrap between the two parts, tie the string tight. Open the arms, divide the 'Super-pompom-maker' in half. Why does it work so good? We see the secret of Super-pompom-maker is the material. The arms are made of hard plastic. It's surface is very smooth. So, the yarn can be wrapped tighter. It looks an overspend if you buy one only to make a few pompoms. However, it is very convenience to make pompoms even and firm. If you are awkward to trim pompom as ball-shape, or tend to make it smaller and smaller while trimming, we suggest it. 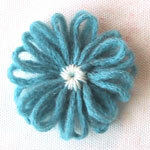 Especially, We feel 'Super-pompom-maker-MINI' is a must to make very small pompoms. The problem is that the join of the arm is very dickey. It can be broken easily if you step on it. And an electricity on the plastic arm gathers fibers. You'd better wipe off the fibers before you make the other color pompoms. 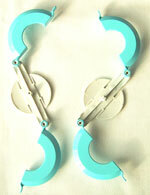 Hanaami-loom has a lot of studs to be hook the yarn making a flower-like object. 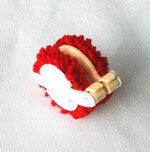 You can use it to make corsage, applique lace, motif of fabric. These parts were all choked up in the little case below. I took them out of the case carefully with a great effort to catch up the every positions of the parts. Even then, I could not choke up them again at once. 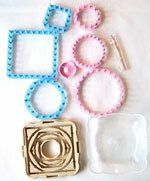 They are tree round frames, two square frames, one hexagon frame and one tapestry needle. removed from the frame. The flower motif were made. Wow! It's easy. And it looks beautiful, isn't it? It's fun. But it is so simple that requires the imagination of you. I had no idea when I touched it. You had better buy one with the instruction book together. You can turn your remained yarns to practical use. Of course, a new desire, having the new beautiful yarns to fit it, might comes up. I'm afraid to mention it that we don't know where these gizmos are available out of Japan. This is a link of the manufacturing corporations 'Clover'. I hope it may help you. Copyright© 2001 Tata & Tatao.